If you're not sure which version of OneDrive you're using, or which version of OneDrive you need, here's how to check. This article is about OneDrive for Windows. If you have a Mac, you have only one sync client available. Skip to Sync files with the OneDrive sync client on Mac OS X. Look at the taskbar on your computer, and hover over the OneDrive cloud icon that isn't syncing. Which color icon and hover text do you see? You might need to select the Show hidden icons arrow ( or ) next to the notification area to see the OneDrive icon. A white icon with this hover text: "OneDrive - Personal" or just "OneDrive"
You're using the new OneDrive sync client. A white icon with hover text like this: "Files are up to date"
You're using the previous OneDrive personal sync client. A blue icon with this hover text: "OneDrive - <your company>"
A blue icon with this hover text: "OneDrive for Business" or "OneDrive - <your company>"
You're using the previous OneDrive for Business sync client. If you don't see one of these icons on your taskbar, that version of OneDrive isn’t running or it might not be installed on your computer. 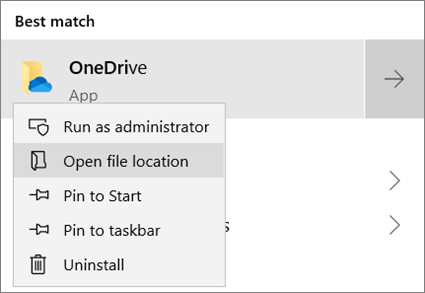 To see if that version is installed but not running, go to Start, enter OneDrive in the search bar, and select OneDrive (for the new sync client) or OneDrive for Business (for the old sync client) in the search results. Note: In the taskbar navigation area, if you have a gray OneDrive cloud icon , you have the OneDrive desktop app but haven't set it up for your work or school account. Select the icon and sign into either your personal or business account with your work or school account information. Another way to see which version of OneDrive you have is to check the name of the OneDrive sync client in File Explorer. Go to Start, type OneDrive in the search box, and right-click either OneDrive or OneDrive for Business. 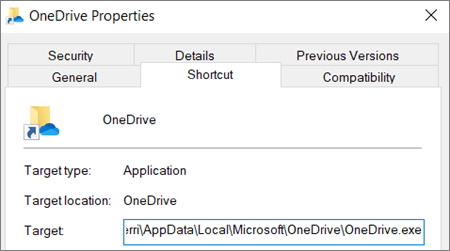 In File Explorer, right-click the OneDrive application and select Properties. If the text ends in OneDrive.exe, you have the OneDrive desktop app. If the text ends in Groove.exe, you have the previous OneDrive for Business sync client. If the text ends in SkyDrive.exe, you have the previous OneDrive personal sync client. Which sync client do I need? If you want to sync personal files from a OneDrive personal account, or your work or school files from an Office 365 business or education subscription, you'll need to use the OneDrive desktop app. If you want to sync files from SharePoint sites, you might also need the previous OneDrive for Business sync client, depending on how your organization has set up your sites. OneDrive personal accounts and OneDrive accounts associated with Office 365 Home or Office 365 Personal subscriptions. OneDrive for Business or SharePoint sites that are associated with Office 365 business or education subscriptions, or SharePoint Server 2019. To get the OneDrive desktop app, see Sync files with the OneDrive sync client in Windows. If what you want to sync includes one or more SharePoint on-premises locations, you need to have the previous OneDrive for Business sync client, even if you also have the OneDrive desktop app. To get the previous OneDrive for Business sync client, see Sync SharePoint files with the OneDrive for Business sync client (Groove.exe). Tip: If you sync OneDrive files to your Mac, you’re already using the OneDrive desktop app. See Sync files with the OneDrive sync client on Mac OS X.
Download and run the Support and Recovery Assistant for Office 365. Choose the OneDrive for Business option when you run it and follow the on-screen instructions to resolve your issues. For help downloading and using the Support and Recovery Assistant, see: Fix Outlook and Office 365 issues with Support and Recovery Assistant for Office 365. Fix OneDrive sync problems - for steps on how to troubleshoot OneDrive sync problems. Or, you can get help by emailing the OneDrive support team.